Join Harper's Magazine and Book Culture on Columbus for a conversation with renowned economist and Nobel Prize winner Joseph E Stiglitz at on Wednesday, November 29 from 7:00 p.m. - 8:00 p.m. Doors will open at 6:30 PM. 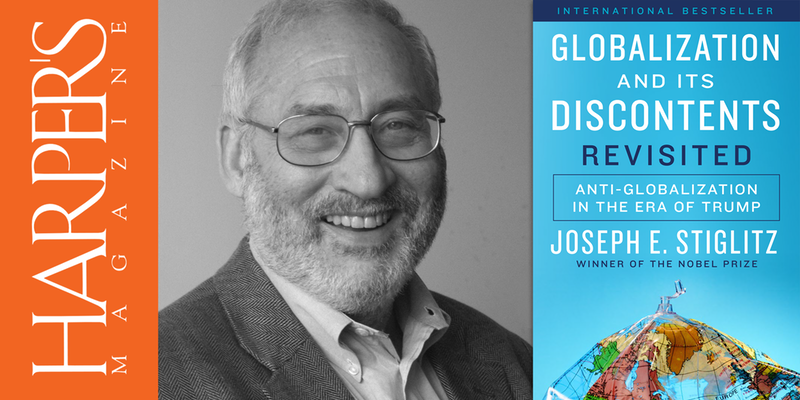 Professor Stiglitz will discuss his landmark book, Globalization and Its Discontents, which has just been reissued with new material from W.W. Norton. Harper's Magazine President and Publisher John R. MacArthur will lead the conversation. Felicia Wong, President of the Roosevelt Institute, a co-sponsor of the event, will introduce the speakers. Tickets are available now - $25 for General Admission and $20 for Students. Ticket includes admission, a copy of the new edition of Globalization and Its Discontents and a one-year subscription to Harper’s Magazine.